OMAHA, Neb. (KMTV) — Anne Race has been managing her lymphedema for decades. The breast cancer survivor developed it after her treatment for cancer. "There's no cure, no cure, so it's something you have to live with, and I've lived with it for 23 years," Race said. Lymphedema is a condition in which fluid backs up in a limb. It can create a feeling of tightness or heaviness. Race can't lift her arm over her head. Lymphedema can develop for various reasons including after cancer treatment. 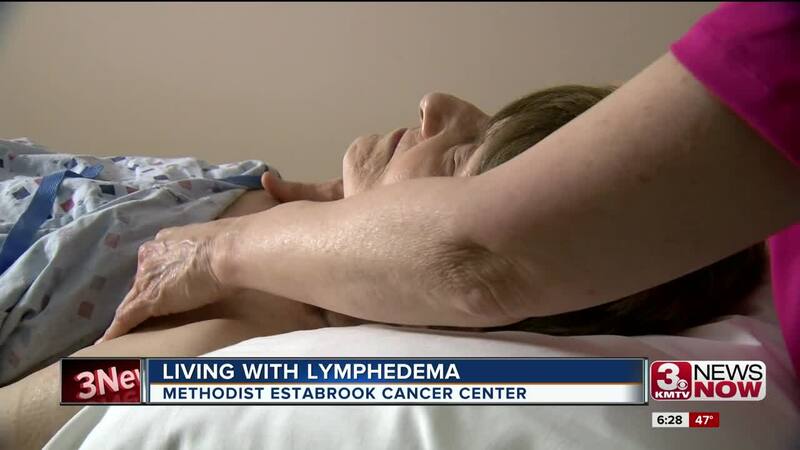 "Anyone who has had lymph nodes removed or radiated in the treatment of cancer is considered to be a risk," said Wendy Buchholz, a certified lymphedema therapist at Methodist Estabrook Cancer Center . Research varies but some studies say about 40% of breast cancer survivors will develop lymphedema. The system can back up with fluid if a lymph node has been removed. Race receives treatment about once a week or once every two weeks. Buchholz manually clears fluid out of intact lymph nodes. She then can guide the excess fluid in that direction. She also uses compression wraps on the affected limb. Race wears compression sleeves day and night. They're hundreds of dollars or more and need to be replaced every six months to a year. Race and Buchholz support the Lymphedema Treatment Act which would require Medicare coverage for compression sleeves. The Lymphedema Advocacy Group created this web site about the legislation . ( Senate Bill , House Bill ) They are a non profit dedicated to improving insurance coverage for lymphedema patients.